Israeli Artists Say No to Performing in Ariel – and Support is Growing! Last week, fifty Israeli actors, directors and producers publicly released a letter saying they would not perform in a new multi-million dollar theater center in the West Bank settlement of Ariel and that they would continue to do so until there was an Israeli-Palestinian peace agreement. Theater actors are not marionettes, and cultural coercion of artists who fear for their livelihood does not befit a freedom-loving country. Cultural and academic institutions that receive budgetary support from the state do not owe it obedience in return. On the contrary, the government should be thankful for the existence of institutions that constitute such a vital interest for Israeli society. Now it appears the struggle has moved to the United States. I’m so incredibly proud to see that Jewish Voice for Peace has now organized a support statement by over 150 American and European theater and film professionals – including Mandy Patinkin, Theodore Bikel, Eve Ensler, Tony Kushner, Cynthia Nixon, Ed Asner, among others. This is big. Indeed, as the government’s apoplectic response clearly demonstrates, it represents much more than a mere symbolic stand. To stand up against performing in Ariel, which Netanyahu has described as the “Capital of Samaria,” means to stand up against the very heart of Israel’s settlement enterprise. 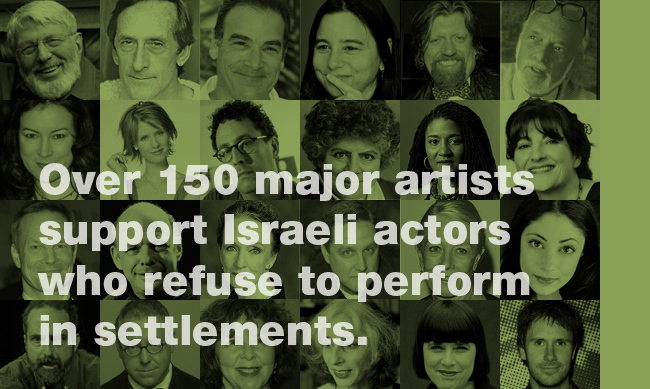 It is also the most significant internal cultural boycott to ever take place in Israel – and the support of the artistic community around the world shows that there is a growing constituency of prominent figures who are willing to publicly speak out against Israel’s impunity. In other words, the artistic community is stepping up and going to the places to which our politicians seem unwilling to go. Bravo! This entry was posted in Art, Israel, Palestine, Politics, Theater on September 6, 2010 by Rabbi Brant Rosen. What is important is not whether some Grade-B performers come to Ariel but how the town already numbering 20,000 is continuing to grow and thrive. By the way, it might interest you to know that the Judea/Samaria University Center in Ariel has a large number of ARAB students. They don’t seem to have any problem going there! As a demonstratively Zionist institution, the University Center has two key requirements: every student must study one course per semester on some aspect of Judaism, Jewish heritage or Land of Israel studies, and the Israeli flag must be displayed in every classroom, laboratory and auditorium on campus. No matter how impressive you might consider this institution or how thriving Ariel might become, the fact remains that it is a settlement in a militarily occupied territory and it is highly presumptuous to pretend otherwise. Ariel University Center of Samaria…is at the forefront of a dramatic change that is taking place in higher education in Israel. Students from across the country attend the University Center, with 70% coming from the greater Tel Aviv area and central Israel and the remainder from northern and southern Israel. As such, the school is a truly national institution and serves as a “melting pot” for all levels of Israel’s society. This is so exciting! Thanks, Brant, for posting this to your blog. How great to see that there are people in the arts who support ending the occupation, and what better way to support artists than to come from other artists! If the two are to share the land equally, then the same proportion of Jews should be allowed in the “East Slope” as there are Arabs in Israel. This makes the settlements way less of an issue, but at the same time does the same for the issue of exact borders. If the two are to share the land equally it must be be as citizens of a single, genuinely democratic state that does not define itself as a Jewish state, an Arab state, a Muslim state, a Christian state or any other religiously or ethnically-specific state. There is no other arrangement by which the land can be equally shared.